When we started prepping for Halloween at the beginning of October, we asked Georgia what she wanted to dress up as. I thought for sure it would be one of her favorite princesses, and was already planning in my head how I was going to convince Lincoln to dress up as Prince Charming- maybe if I let him carry a sword? The pictures would be so cute! But the answer she had ready was not the one I was expecting- SUPERHERO'S!! As in capes and masks? -yes! As in Batman and Robin? -yes! And Super Girl! As in fighting bad guys and saving the day? -yes! As in NOT a princess?? -yes! We can ALL be Superhero's!! Alrighty then! I can work with that! And the guys were definitely more excited about that idea. I had seen a couple of friends make capes for their kiddos, and it seemed like a project I could handle, so I went looking and found this tutorial, which I loosely used. They took me a little bit of time (mostly bc everything I do is interrupted 157 times) but turned out cute and will hopefully be used in many Superhero escapades to come! 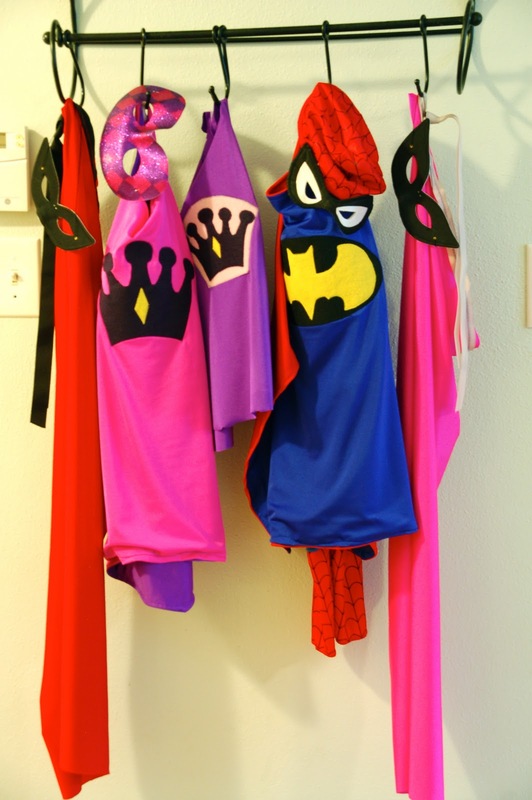 Every Super Family needs their capes and masks hanging by the door, ready to go. The Super Hipps: Super Daddy, Super Girl (who sometimes wears a kitty mask), Super Spiderman (who has a mask but refuses to wear it bc he's not afraid of anything, let alone his identity being exposed), Super Mommy, and Super Baby. 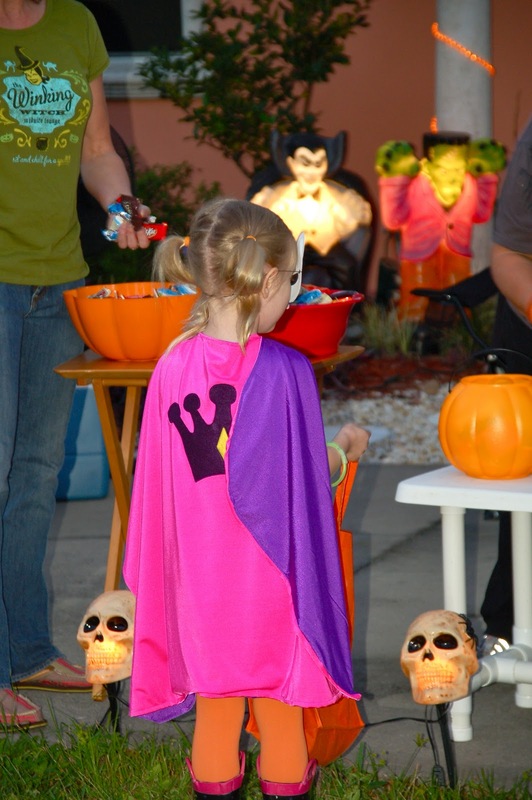 Enough pictures- time to Trick or Treat! Grammie and Grandad joined us, and Uncle Wes and Aunt Jen caught up with us later. Here's a classic example of taking a picture with the flash (first one of Grammie & Grandad) and without the flash (here). Without gives a prettier picture, but the slightest movement (like a baby wiggling!) makes a blur. I do love the pink flash in the bottom left- that is a kid running by to trick or treat! Our loot after a Super Halloween night! Love the pics and costumes! Good talking to you today!